David J. Westrich, MD, FACS returned to his hometown of Cape Girardeau, Mo. after completing his vitreoretinal surgery fellowship in Nashville, Tenn. In 1991, Dr. Westrich founded Cape Retinal Surgery Center, a practice specializing in vitreoretinal disease and surgery. Cape Retinal Surgery Center added Low Vision services in 1992 with the association of Michael Katich, OD. Dr. Katich’s skills in prescribing low vision devices helped maximize our services to patients with low vision due to retinal eye disease. The practice quickly grew from a retinal office to a multi-specialty ophthalmology practice in 1998 with the addition of fellowship-trained surgeons and satellite locations in three states (Missouri, Illinois, and Kentucky). The name was changed to Eye Care Specialists to encompass the various divisions of clinical ophthalmology specialization. The specializations of Eye Care Specialists expanded to include corneal conditions, glaucoma, cataract surgery, and LASIK laser vision correction in 1998 when corneal and refractive specialist, D. Shawn Parker, MD, FACS, moved to Cape Girardeau from Kentucky to join the practice. Services were further extended, both clinically and geographically, when general ophthalmologist, Brad Stuckenschneider, MD, FACS, joined the practice in 2003 and became director of a new facility in Poplar Bluff, Mo. Originally from Odessa, Ukraine, Tatyana I. Metelitsina, MD moved from the Chicago area to Cape Girardeau in 2014. Dr. Metelitsina helped to fulfill the vast need for an additional vitreoretinal specialist and surgeon in this area. Eye Care Specialists saw significant growth in both physicians and services most recently with the integration of Eye Consultants, Inc. In 2018, general ophthalmologists, Todd Lumsden, DO, FAOCO and John Kinder, MD, FACS, became partners of Eye Care Specialists. Combining expertise, skills, and technology not only enhanced our wide-range of services, but also the areas we serve by adding locations in Perryville, Mo. and Dexter, Mo. 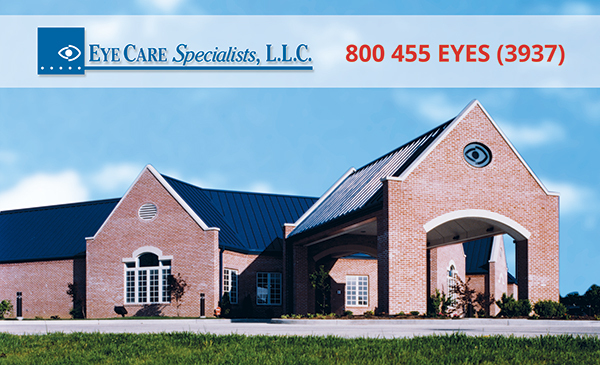 Through this affiliation, Eye Care Specialists was pleased to gain the services of ophthalmologist, Richard Kies, MD, FACS, who has a long-established reputation in Cape Girardeau with over 35 years of experience in this area. In addition, the Eye Care Specialists and Eye Consultants, Inc. union has also enhanced specialty services we offer through the association of retinal specialist, T. Kim Krummenacher, MD and oculoplastics specialist, Byron Santos, MD. Our Patients Are Our Focus! Our continued growth facilitates our mission to provide the highest quality of specialized and comprehensive eye care to patients in a caring, personalized, and service-oriented environment across the tri-state area. We desire that our quality of care, patient education, and our full suite of services including retinal surgery, cataract surgery, LASIK, glaucoma treatment, and oculoplastics allow you think of Eye Care Specialists as the first and best option for your specialized eye care. Nothing is more important than your eyesight…that’s the way the doctors of Eye Care Specialists see it! At Eye Care Specialists, we do not just want to meet your expectations but exceed them. If we fell short, please let us know so we are aware we need improvement. If we did something great, we of course love to hear those experiences as well to know we are on the right track! Please share your experience with us using the contact form to the right. Thank you for choosing Eye Care Specialists!